The Zebra ZXP Series 3 Full Color Ribbon YMCKOK (item# 800033-348) has been designed to produce vivid colors on one side of your cards and sharp black text or barcodes on the back. The YMC (Yellow, Magenta, cyan) will create stunning color images while the Black (K) panel will print sharp text or barcodes. The Overlay (O) panel will protect your cards from wear and tear and extend the lifespan of your cards. Your dual-sided Zebra ZXP 3 ID card printer will then flip your cards to personalize the back of your cards with black text, barcodes or images. This high-capacity dual-sided ribbon offers 230 images per roll. As a result, you get more prints at a lower cost per card. You will also increase your card production rate and therefore maximize productivity. The Zebra ZXP Series 3 full color YMCKOK ribbon is eco-friendly: the cartridge and core contain a special additive that speeds up biodegrading. The ribbon cassette is made with recyclable plastic for a lesser impact on the environment. 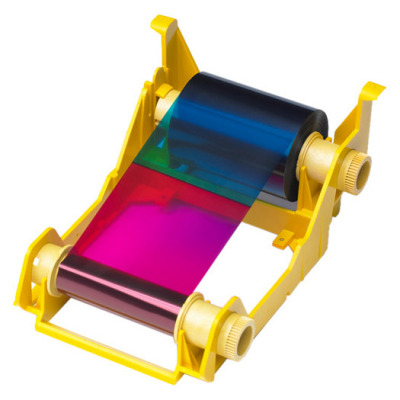 The Zebra ZXP Series 3 full color YMCKOK ribbon is for use with Zebra ZXP Series 3 card printers.